Chelsea have released their squad that will tackle Slavia Praha in today’s UEFA Europa League quarter-final first leg tie at Sinobo Stadium. According to Football London, Chelsea manager, Maurizio Sarri has released a list of 21 players. Chelsea head to the game following a 2-0 victory over West Ham United in the Premier League encounter on Monday. 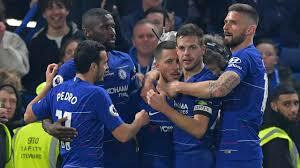 The Blues reached the Europa League last eight after defeating Dynamo Kiev 5-0 in the round of 16 second-leg encounter last month.